Although the rehoming of laboratory dogs has gained popularity, a scientific evaluation of the process is lacking. The behavior of 145 laboratory beagles was tested before leaving a research facility (Test 1). The new owners were then surveyed using a standardized telephone interview 1 week (n = 143) and 12 weeks (n = 126) after adoption. The behavior test was repeated with 68 dogs in their new homes 6 weeks after adoption (Test 2). The predictive power of Test 1 or Interview 1 on Test 2 or Interview 2, respectively, as well as the relevance of various factors was analyzed. We found no significant differences between Tests 1 and 2 regarding the behavior reactions. However, body language scores and heart rates changed significantly, indicating a more relaxed state of the dogs in their new homes. The interviews revealed a significant change toward desired behavior in most dogs within the 11 week period (p < 0.0001). The main behavior problems included separation problems (28%; n = 126), destroying objects (24%), and not being housebroken (39%). Owners of 9 dogs returned the animals, resulting in a rehoming success rate of 94%. Test 1 revealed a significant age effect (p = 0.0066), with younger and older dogs reaching higher scores than dogs who were approximately 2 years old. Dogs that had been born and reared in the research facility scored higher than dogs that had originally been acquired from a commercial breeder (p = 0.0257). The predictive power of Test 1 on Test 2 or Interview 1 on Interview 2 was moderate to low, respectively. Altogether, rehoming of laboratory dogs is a valuable alternative to euthanasia. 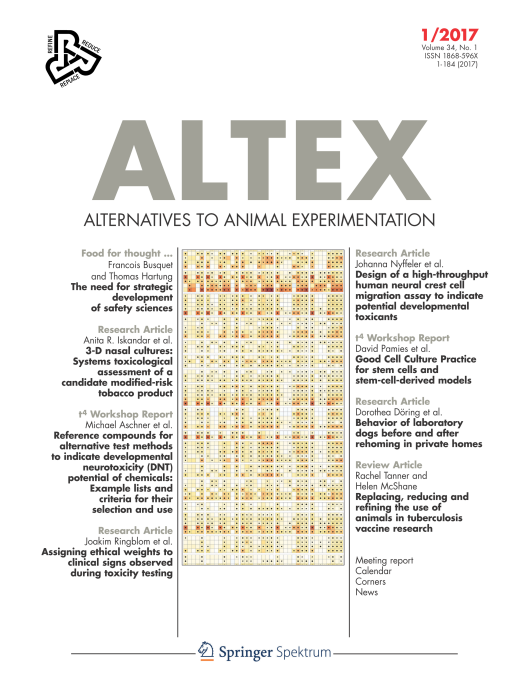 Döring, D., Nick, O., Bauer, A., Küchenhoff, H. and Erhard, M. (2017) “Behavior of laboratory dogs before and after rehoming in private homes”, ALTEX - Alternatives to animal experimentation, 34(1), pp. 133-147. doi: 10.14573/altex.1608171.